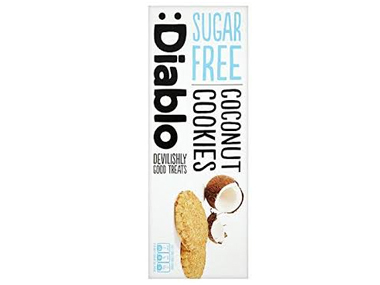 Order Diablo Sugar Free Coconut Cookies from the Online Health Food Store UK. Buy Diablo Sugar Free Coconut Cookies and other quality Sweet Biscuits safely online in the UK. Very popular biscuit in our new range of sugar free biscuits; super tasty coconut cookies with no added sugar! Wheat flour, margarine (vegetable oil-palm oil and colza oil, emulsifiers: E 467, soy lecithin, salt, preservative: potassium sorbate, flavouring, colouring: annatto), 8.33% coconut, malititol, raising agents (E450i, E500ii), salt, flavouring, colouring: beta carotene. Where to buy Diablo Sugar Free Coconut Cookies safely online? Shop at the Online Health Food Store if you are wondering where you can buy Diablo Sugar Free Coconut Cookies safely online in the United Kingdom. Sugar Free Coconut Cookies - Diablo Sugar Free Coconut Cookies in Sweet Biscuits and Biscuits & Breads.